Influenced by Enlightenment principles and commercial transformations, the history of the book in the eighteenth century witnessed not only the final decades of the hand-press era but also developments and practices that pointed to its future: 'the foundations of modern copyright; a rapid growth in the publication, circulation, and reading of periodicals; the promotion of niche marketing; alterations to distribution networks; and the emergence of the publisher as a central figure in the book trade, to name a few.' The pace and extent of these changes varied greatly within the different sociopolitical contexts across the western world. The volume's twenty-four articles, many of which proffer broader theoretical implications beyond their specific focus, highlight the era's range of developments. 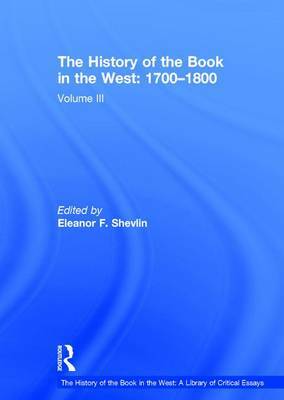 Complementing these articles, the introductory essay provides an overview of the eighteenth-century book and milestones in its history during this period while simultaneously identifying potential directions for new scholarship.